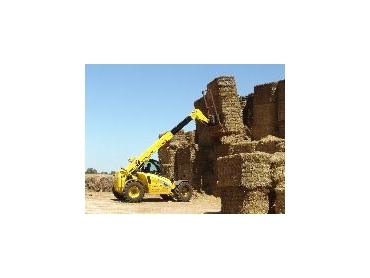 New Holland Construction has introduced LM series telehandlers for use in a wide range of agricultural applications from hay handling to loader work. All three models are powered by a 4.5L fuel efficient engine and feature a low centre of gravity, easy service access, good overhead visibility and enhanced right hand side visibility. All three models are produced at the New Holland factory in Leece, Italy and lift capacity ranges from 3,200kg on the LM732 model to 6,000kg on the LM1060 model. “The LM732 is ideal for general farm duties with its joystick controls, heavy duty drive line and power shift transmission making it both easy and economical to operate,” explained Kieron Thompson, New Holland Construction Product Manager. “Its versatility makes it ideal for use in a wide range of applications from handling hay, fertiliser and bulk inputs, to feeding out. “The LM740, with its four tonne lift capacity and 7 m lift height, is ideal for farmers undertaking high production hay handling, or for those requiring extra lift capacity with the boom extended. “With its user friendly and precise variable flow hydraulic system, the LM740 is designed to deliver stability and smooth control, particularly for jobs such as stacking large rectangular bales three at a time. “The 120 Hp engine also makes it an excellent choice for farmers needing a machine capable of high-capacity bucket work. “Meanwhile, the top of the line, heavy-duty LM1060 model, with a six tonne lift capacity and 10 m lift height is built for use in rough terrain and heavy duty applications such as lifting grape bins, concrete structures, or other heavy equipment,” said Kieron Thompson. The design of the new models enables them to meet the recent Australian Safety Standards. “Under the new AS1418.19. standard, any machine with a suspended load needs to provide the same level of safety as a crane,” Kieron Thompson explained. “To achieve this, we have designed the new range to prevent overloading of the machine and attachment through the inclusion of a programmable load management system which also delivers additional benefits such as displaying the mass of the load being lifted. “Our new range is also engineered to suit Australia’s rugged working conditions,” he added. “For example, we’ve increased the size of the cooling system surface area to prevent overheating and ensure continuous cycling even in hot, dusty conditions. “On the LM732 and LM740 models, the cooler pack surface areas are much greater than the previous models, and a reversing fan to keep the coolers clear is standard,” said Kieron Thompson. When it comes to service, simplicity is built into the design with oil changes at 500 hour intervals and easy access to key engine components. The LM732 and LM740 are currently available in Australia while the larger LM1060 model is due to arrive by October 2008. New Holland also produces other models with lift heights ranging from 11 to 17 m, suited to the construction industry.